Looking for private in-home or in-studio Flute lessons? Our Baldwin teachers are ready to get you started. Find your teacher today! Check out some of our most popular teachers near Baldwin, NY including New York, Brooklyn, Bronx, Jersey City and Astoria. Although I am primarily a saxophonist, flute is a secondary instrument that most saxophonists also have to know how to play. As a performer it is an absolute necessity that I be able to double on the flute and be just as proficient. I have a wide range of experience in different genres of classical music having played in a variety of ensembles: orchestral to contemporary. In addition to learning the basics of flute playing, I can introduce students to extended techniques on the flute. I also believe that music lessons should be fun, and would LOVE to help you play your favorite music -- whether it's classical music, or your favorite song on the radio. More about my education and experience: I received my Bachelor of Music degree at Grand Valley State University (GVSU) in Michigan, and came to NY to pursue my Master of Music at NYU. During my time at GVSU, I played with the New Music Ensemble (NME), in addition to playing in orchestra and wind ensemble. At NYU, I am playing with the NME, Contemporary Music Ensemble (CME), and NYUO1 (orchestra). I can be heard on GVSU NME's latest album "return," and on the GVSU Symphonic Wind Ensemble's album "Under Western Skies." I hope to hear from you soon! 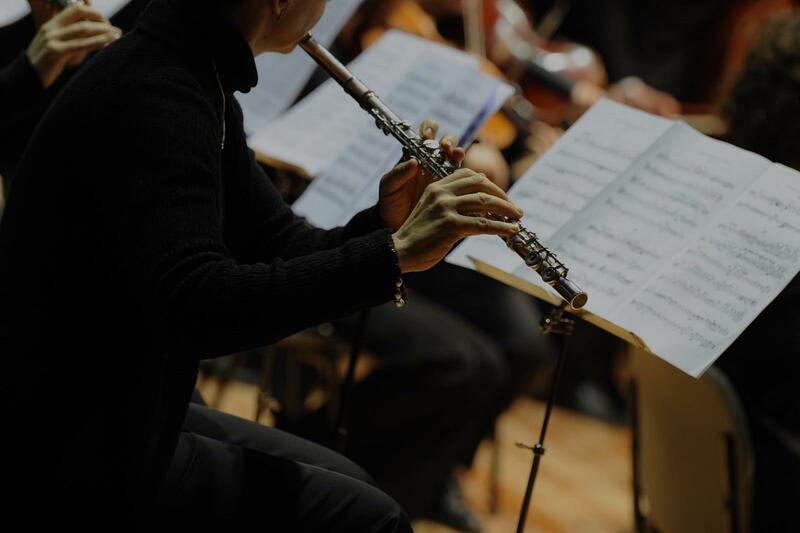 During my time at Grand Valley State University (GVSU), I was principal flutist in the GVSU Symphony Orchestra and the GVSU Symphonic Wind Ensemble (SWE). While part of the GVSU SWE, I was part of a recording project with them for trumpet concerti and can be heard on the album "Under Western Skies." The trumpet soloists on this album are Richard Stoelzel and Rex Richardson. While a member of the GVSU NME, I was a part of a recording project featuring music composed by GVSU composition alumni for the album "return." I have been on mulitple tours with the GVSU NME: 2016 Midwest Tour, 2016 National Parks Tour, and 2018 National Parks Tour. The GVSU NME has also been featured on NPR's Performance Today series. In 2017, I performed at the New Music Gathering with the GVSU NME. al and contemporary ensembles. Having played in band, orchestral, and chamber settings, I am able to help students improve in each of these classical music settings. In addition, I believe the student should also have a say in what they study in lessons. Meaning, I would also love to help students play other genres outside of the classical realm. I hope to hear from you soon! I try and create an environment where we aren't just trying to learn notes on the flute but learn great musicianship, and building confidence! As a student at a music conservatory, I believe that is is crucial to learn aspects of musicianship, such as some level/understanding of ear-training and music theory. Lastly, I want my students to reach their fullest musical potential while having fun! Can't find a teacher in Baldwin, NY? ding many solos. When she needed instruction above what her school could offer her, I went online and found Brenda's profile. Brenda's resume for performance and teaching is impressive. What the resume can't speak to is how well she works with her students. Brenda helped my daughter immensely when she needed it most not only technically with her playing, but with her confidence. I would recommend Brenda as an instructor for any age or skill level." d she has always tailored her lessons to me in an easy, relaxed manner with a mind to achieving my goals. She makes you look at things differently.I highly recommend Roberta." sons with Rebecca, and enjoys his lessons. Rebecca is highly recommended." gress during this time. Roberta is a wonderful flutist and an extraordinary, dedicated teacher. She inspires and motivates her students, and knows how to communicate with them on the appropriate level. She has a warm personality and a good sense of humor. My daughter always looks forward to her lessons with Roberta. I highly recommend Roberta both as a flutist and as a flute teacher for any level of student." also very flexible which really helps those of us with crazy schedules. If you wish, class time can focus on music theory along with the actual playing of the flute which is very valuable (in my opinion). He's given me great tips with regards to embouchure and tone, not to mention with reading music and applying them to my playing. His instruction has really helped me improve my playing overall. I highly recommend Matt." hile practice at home is still key for the student to be able to play, Bill has been instrumental in ensuring that our kid is playing the flute with the best practices. He is always in good humor, and flexible in fitting us into his schedule." "Very knowledgeable and in tune musically and internationally"
"Excellent, great with 4 year old!!!"